It's not the largest denomination, but the $20 bill holds a very special place in our hearts and wallets. Maybe it's because it's what people in heists always request? (Non-sequential.) Maybe it's because $20 is the highest denomination you can whip out without causing eye rolls? Or maybe it's because it's the perfect amount to wager with a friend: high enough to raise the stakes, low enough not to devastate whomever loses. 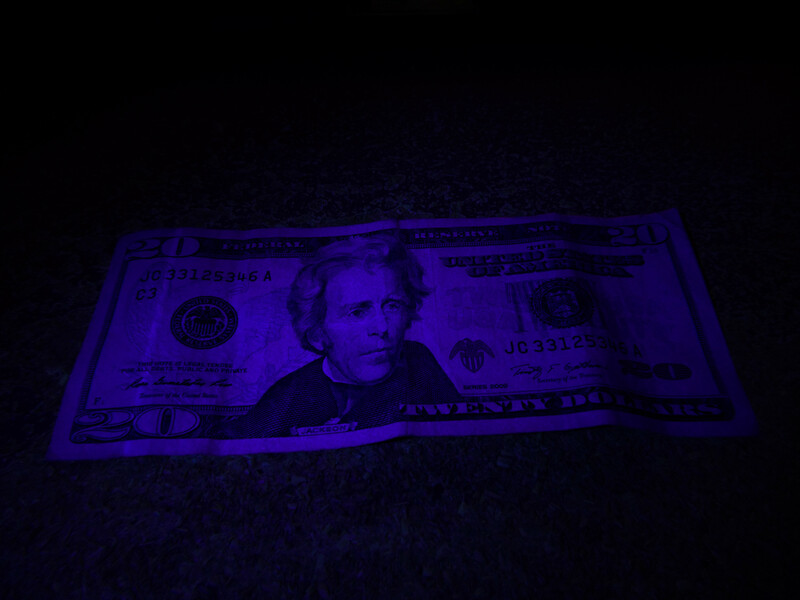 The original $20 bill. It is, technically, a gold certificate, so you could cash this in for the ingots if you were Shaun White. Alexander Hamilton lands on the bill. This is ironic, since he was known for being a poor duelist, as the current monster on the $20 bill was known as a phenomenal duelist. This green, yellow, and orangey banknote opted for ol' Georgey boy, because the $1 just wasn't enough of a tribute. It really stresses the "gold coin" concept of paper money. Bumping GW off the bill, Grover Cleveland's face is turned to the right, as every $20 bill dude thereafter would be, too. These are also the first bills issued by the Federal Reserve. For whatever reason, they swapped out Cleveland for Jackson. No one seems to be sure why, and the reserve won't reveal why. This is also the first year of the small-sized note, which replaced the preceding bills that were about an inch taller and wider. The White House also made the back for the first time, probably because the White House couldn't evolve, like a train or ship. The banners up top are gone, replaced by straight text. The issuing Federal Reserve Bank is given a non-circular treatment. It also gets rid of the "on demand" aspect of the bill, meaning it will not give you gold if you ask for it. Ugh, jerks. No wonder this happened in October. Now the bill says it's redeemable in "Lawful Money." But isn't this money??? It looks like there's some National Treasure business going on here, but they just mean silver—not gold. Remember how they replaced the very changeable transportation methods with the static White House? Well, they had to update the back of the bill when it was remodeled. They added a balcony and the trees grew, and the bill had to catch up with the times. The probably unconstitutional "In God We Trust" also snuck onto the bill. Tiny change in the Treasury seal and a new font for the serial numbers. This is the golden age of the classic $20 bill, which doesn't change much. But in 1990, they added an ultraviolet ribbon to the side that illuminates under a black light. 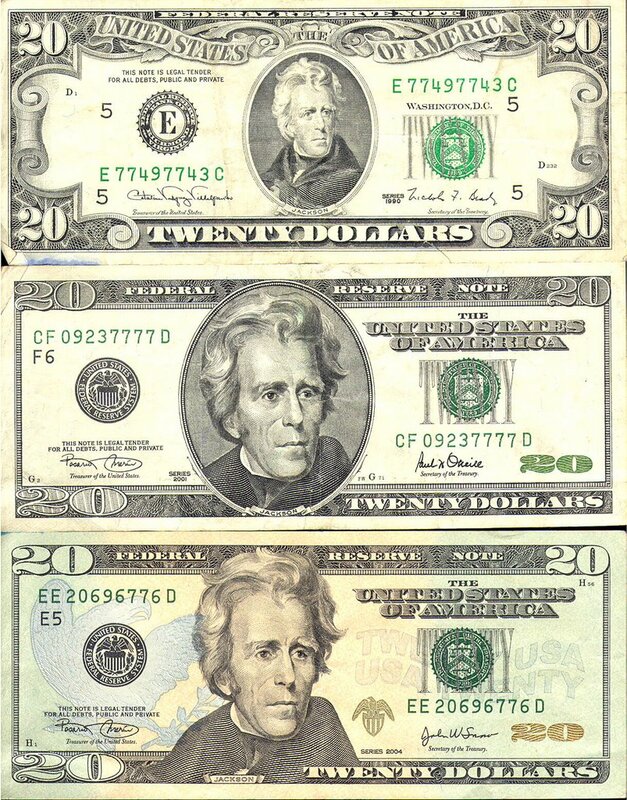 Many people probably had embarrassing moments with $20s that year while the counterfeiters caught up. We welcomed the new $20 bill with open arms. Larger and off-center portrait, watermarks galore, and more, including a north-side view of the White House. More countermeasures, no oval around the Old Hickory, and 90 faint "20s" on the back in a special pattern that's easy for scanners to recognize. Ethan Wolff-Mann is an editor at Supercompressor. He wonders whether an electronic-only payment world will come before the next twenty. Hopefully not. Follow him on Twitter @ewolffmann.